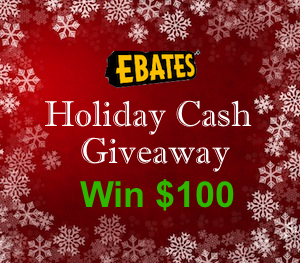 Giveaway: $100 Cash Bonus From Ebates! Update: Congratulations to the winner, Pauline M, and thanks to everyone who signed up! Still got some holiday shopping to do? Now is a great time to sign up at Ebates.com to earn cash back for your holiday gifts because many stores offer double cash back for the holidays. Plus, this Monday is Free Shipping Day, where you can find all the best free shipping deals to get your gifts in time for the holidays.